Purposes of the training: learn the basics of Gel electrophoresis. The first, four 20% denaturing gels need to be prepared (Picture 1). About 3 ODs of each strand is loaded to the one denaturing gel. These gels contain 8.3 M urea and are run at 55 �C. The running buffer consists of 89 mM Tris.HCl, pH 8.0, 89 mM Boric acid, 2 mM EDTA (1XTBE). 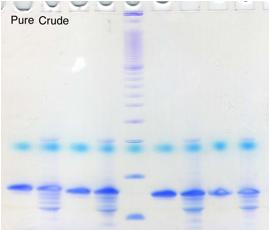 The sample buffer consists of 10 mM NaOH, 1 mM EDTA, containing trace amount of Xylene Cyanol FF and Bromophenol Blue tracking dye. 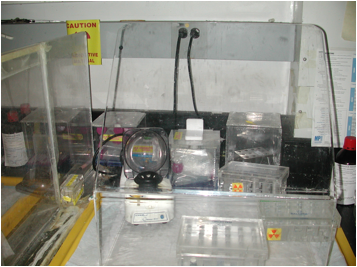 Gels are run on a Hoefer SE 600 electrophoresis unit at 55 �C (30 V/cm, constant voltage) (Picture 2). Ethidium bromide stained main bands, which contain the whole-length products, are cut of 20% denaturing gels with a razor blade and transfer to 1.5 ml microcentrifuge tube. Then add the elution buffer containing 500 mM ammonium acetate, 10 mM magnesium acetate and 1 mM EDTA and shake overnight. Spin 1 min and collect the supernatant. The eluates are subjected to extraction with n-butanol to 1/3 of the original volume and add 1ml 100% ethanol. Place the tube in dry ice for 45 mins and Spin at 10,000 rpm (13,000 X g) for 30 min in microcentrifuge. Discard the supernatant and wash the pellet by adding 1ml 70 % ethanol and spinning 7 mins. Then the strands are dried and resuspend in TE buffer. 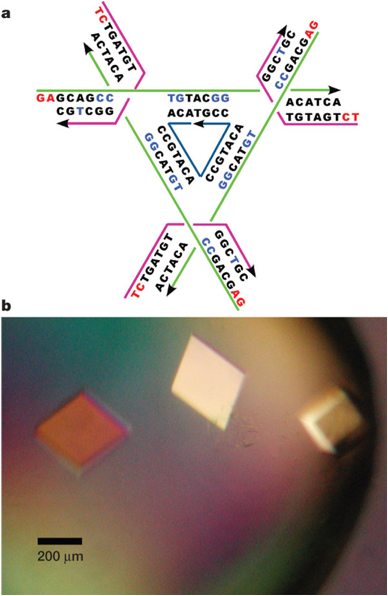 Quantify DNA by measuring the absorbance at 260nm wavelength. We assume that roughly 1OD equals to 35 ug DNA and the molecular weight for a single base is 330. Usually a purity-check gel need be done to assure the quality of the purified strands. 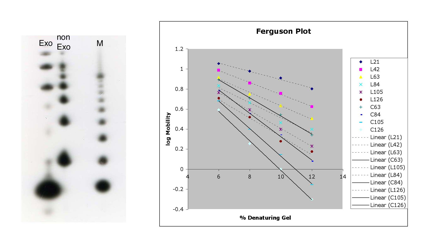 Make sure that the mobility of the strands corresponds to the expected strand length comparing the DNA ladder marker and no visible lower bands, which indicate the partial products (Picture 3). Complexes are formed by mixing a stoichiometric quantity of each strand, as estimated by OD260, in the normal TAE/Mg buffer and DNA concentration is 4 uM. The 10 uL mixture is then heated to 95 �C for 5 minutes and cooled to the desired temperature by the following protocol: 20 minutes at 65�C, 15 minutes at 50�C, 20 minutes at 37�C, 20 minutes at room temperature and 20 minutes at 4�C. Add 1 uL 10X tracking dye which contains 1X TAE/Mg, 50% glycerol and trace amount of Bromophenol Blue and Xylene Cyanol FF to the annealed samples. 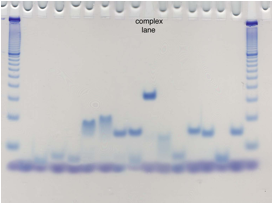 Gel is run on a Hoefer SE-600 gel electrophoresis unit at 12-16 V/cm at 4�C. The running buffer consists of 40 mM Tris-HCl (pH 8.0), 20 mM Acetic acid, 2 mM EDTA and 12.5 mM magnesium acetate (aka normal TAE/Mg buffer). Make sure that the lane in which contains complex has no higher or lower bands (Picture 4). Purposes of the training: learn enzymatic reactions (Kination, Ligation and Exonucleases) and radiation safety. At first, the three strands need be purified as the J1 experiment. The strand 2 is the report strand to which we need add P31 or P32 (radioactive) individually by the kination reaction. The following protocol is for Radioactive (aka hot) labeling of the strand 2. 1 pmole DNA (1 ul), 10x kination buffer (1 ul), 6 ul dd water, 2.2 pmol labeled ATP (1 ul), 1 ul kinase (Diluted, 3 units/ul). Warning: after adding the kinase, you can�t vortex the mixture. The reaction proceeds at 37 degree for about 1 hour. Kinase is inactivated at 90 degree for about 5 min and filtered through the G-25 microspin column (Pharmacia) to remove unincorporated g-32P-ATP. Followed by phenol extraction and ethanol precipitation. Dry down the liquid and hot DNA is purified by 20 % denaturing gel. The gel is exposed to a X-ray film and cut the main band according to the autoradiograph. Recover the DNA strand as the J1 experiment. When you do the radiation experiment, you need always work behind the shield in the designated area with your radiation badge (Picture 5). You also need to repeat the same procedure in large scale by using the normal (aka cold) ATP (non-radioactive). Now you are ready to anneal the JY21 complex. In 20 uL reaction volume, we will add 1 ul 10X ligation buffer, 20 pmole of strand 1 and 3, 19 pmole of cold-phosphorylated strand 2 and trace of hot-phosphorylated strand 2, then add water to 20 ul. Follow the annealing procedure as the J1 experiment. After the mixture was cooled at 4�C, add another 1 ul 10X ligation buffer and 1 ul ligase (10 units/ul). Incubate the mixture at 16�C for 16 hrs and terminate the reaction by heating at 90�C for 5 mins. Purposes of the training: learn how to assemble 2D DNA array and observe it by AFM with the tapping mode. The DNA strands need be purified as the J1 experiment. Usually we use 20% gel to purify the strand below 35mer, 15% gel to purify the strand between 35mer and 55mer and 10% gel to purify the strand above 55mer. Complexes are formed by mixing a stoichiometric quantity of each strand, as estimated by OD260. Exact stoichiometry is determined, if necessary, by titrating pairs of strands designed to hydrogen bond together and visualizing them by nondenaturing gel electrophoresis; absence of monomer is taken to indicate the endpoint. All 20 strands are mixed either in 10 mM HEPES (pH 7.8), 6 mM MgCl2, and 1 mM EDTA (for restriction) or 20 mM Tris (pH 7.6) and 10 mM MgCl2 (for restriction or ligation). The final concentration of DNA is 0.4 uM, and the final volume is 50 ul. 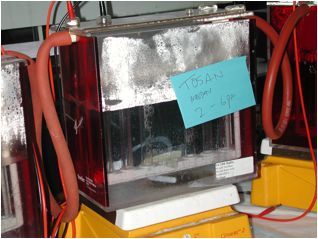 The tube containing the DNA solution is put in about 2 L of boiled water and placed in a Styrofoam box for at least 40 h to facilitate hybridization. Warning: for sealing the tube well, we wrap it with parafilm first and use the clamp afterward. 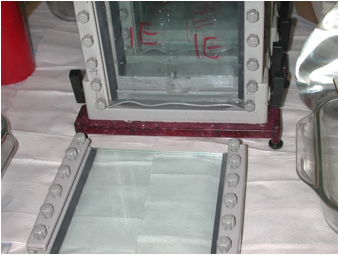 After the annealing is finished, a 5 ul aliquot of a solution containing arrays is deposited on a freshly cleaved mica surface for 1 min and 25 ul of buffer is added. An additional 30 ul buffer will be applied to the tip with fluid cell �right side up� so that the drop is hanging. For the tapping mode imaging in buffer, use the short cantilever (either skinny or fat) on the AFM chip. Make sure to align the photodiodes both side to side (horizontal difference signal) by align the laser in �AFM & LFM� mode and aligning the laser in top to bottom (vertical difference signal) in �TM AFM� mode. Both vertical and horizontal difference should be around 0. When laser is properly aligned, go to auto tune icon and ask for the amplitude of 0.5 volts. The resonance for the small skinny tip should fall between 9and 9.5 kHz. After the AFM is tuned properly, do the engage and enjoy the beautiful images. See Picture 7. 1. The computer should be on whenever the controller is on! Turn the computer on before the nanoscope controller! 2. On the scan control panel, avoid OFFSET voltages outside of +/- 150V for periods of more than about an hour. Whenever it�s possible, reset them to zero. 3. Avoid using maximum scan size for long periods (for instance, size greater than 40- 120 um) if not necessary. 4. Avoid leaking when organic solvents were used (isopropanol) during imaging. 6. Fluid cell is a very fragile since it is made of the glass itself. Avoid dropping it to the floor when you load the tip or install it into the scope head. Please don't press the spring clip too hard when you load the tip. DNA sequences were designed using program SEQUIN and are showed in the picture 8. DNA strands were synthesized by standard phosphoramidite techniques on an Applied Biosystems 394 DNA synthesizer with trityl-on mode. Strands were purified by reverse-phase HPLC (C18 column) with trityl on first and purified again by reverse-phase HPLC (C18 column) after the trityls are removed. Crystals were grown from 80mL sitting drops in a thermally-controlled incubator containing 0.25 mg/mL DNA, 30mM sodium cacodylate, 50mM magnesium acetate, 50nM ammonium sulfate, 5mM magnesium chloride, 25mM Tris (pH 8.5), equilibrated against a 1.5 mL reservoir of 1.7 M ammonium sulfate. Rhombohedral-shaped crystals with dimensions as large as 250�250�250 mm (picture 8) were obtained by slow annealing, in which the temperature was decreased from 60�C to room temperature with a cooling rate of 0.2�C per hour over a period of 7 days, during which the volume of the drop diminished by about 90%. Crystals were obtained at the end of the cooling step, and appeared full-sized within a day. To protect crystals from the damaging effects of ice formation, they were transferred to a cryosolvent of 30% glycerol, 100 mM ammonium sulfate, 10 mM MgCl2, and 50 mM Tris and were frozen by immersion into liquid nitrogen. 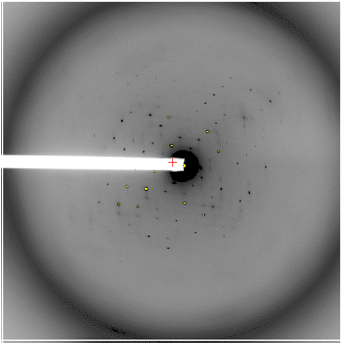 A complete sphere of native x-ray diffraction data were collected at the APS beamline 19ID or beamline X25 at the National Synchrotron Light Source (Brookhaven National Laboratory, Upton, New York, USA) and processed using HKL3000 (picture 9). Processing the diffraction data in either of space group P1 or space group R3 results in essentially the same merging statistics. Processing in R3 provides a higher level of redundancy, so this option was chosen for all subsequent steps.